Whether the interior is rustic, minimalist, modern or contemporary, even for a basement, a great interior always incorporates art. In displaying your sentimental photograph or priceless works of art, maximize exposure by taking advantage of the space over a large piece of furniture like a sectional sofa or above the fireplace mantel. 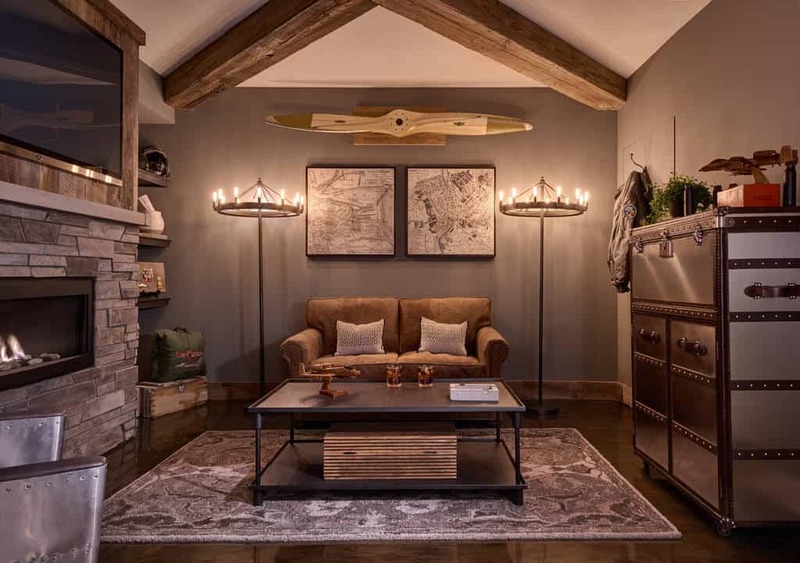 Elements like these help anchor the art placed above them, adding a surprising focal point and helps avoid making the framed piece appear as it was floating on a large wall. It also lends an unforgettable edge to your space. 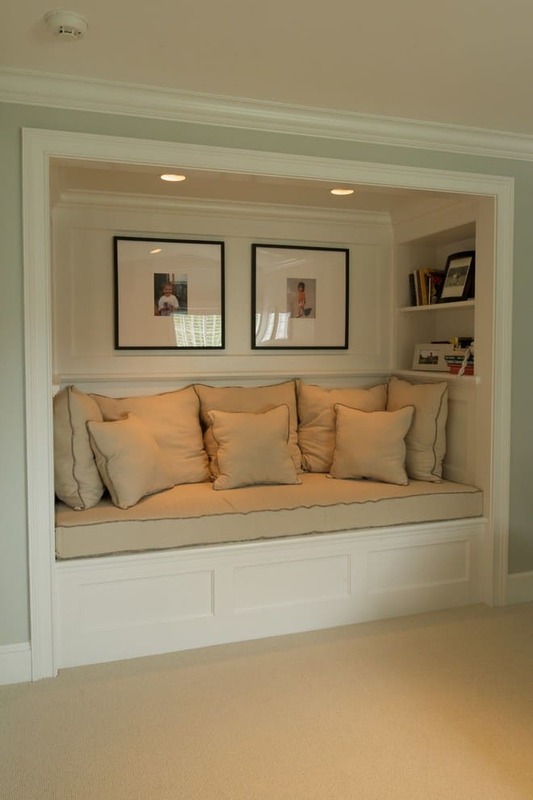 No matter the time of year, oversized windows will allow abundant natural light all year long and help makes the intimate seating area in your basement feel welcoming. Large glass windows can also work wonders especially when the winter blues come. 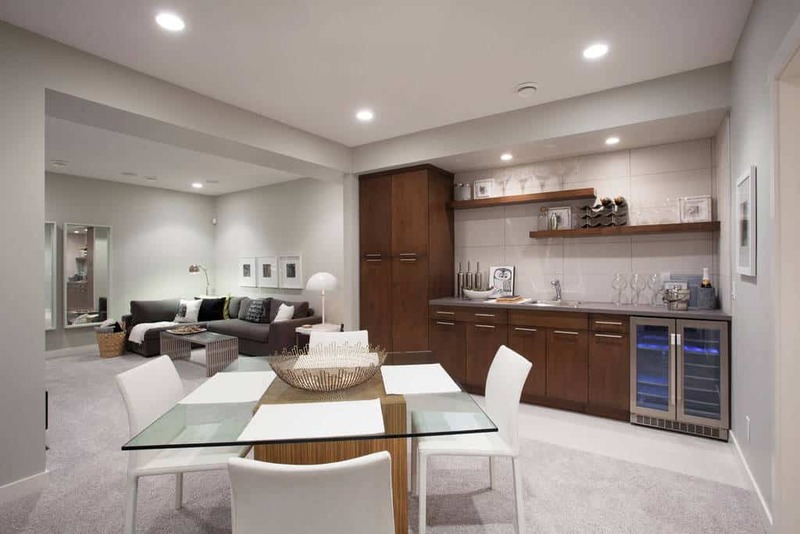 However, for basements that don’t have the luxury of natural lighting, a strategic placement of accent light fixture to illuminate your artwork is your best option. 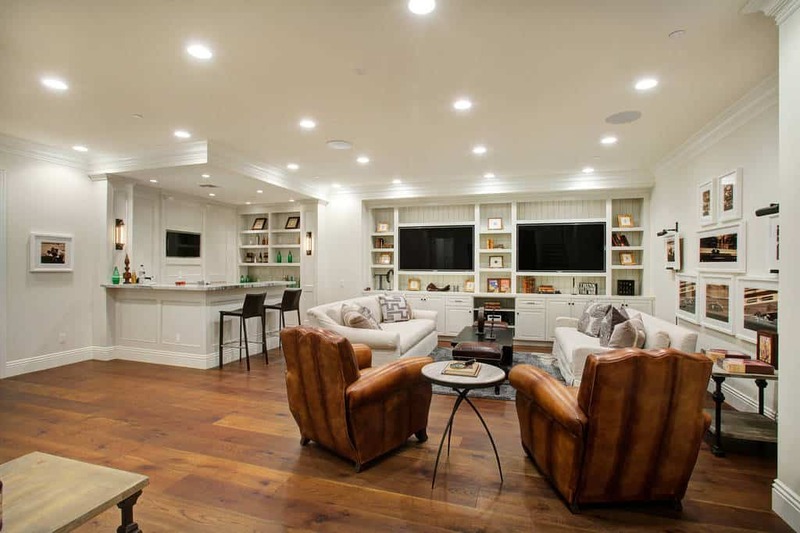 A couple of downlight in a series or an uplight along the hallway will shine the light and helps give emphasis to an already interesting art piece. You can also utilize table lamps or floor lamps for the same purpose. 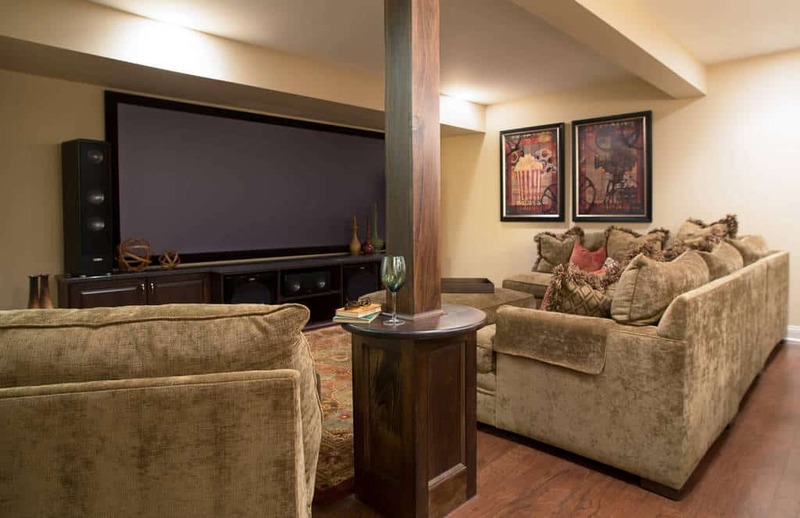 Read on to see charmingly sophisticated designs for a basement that some illustrates excellent ideas how to display your favorite artworks. 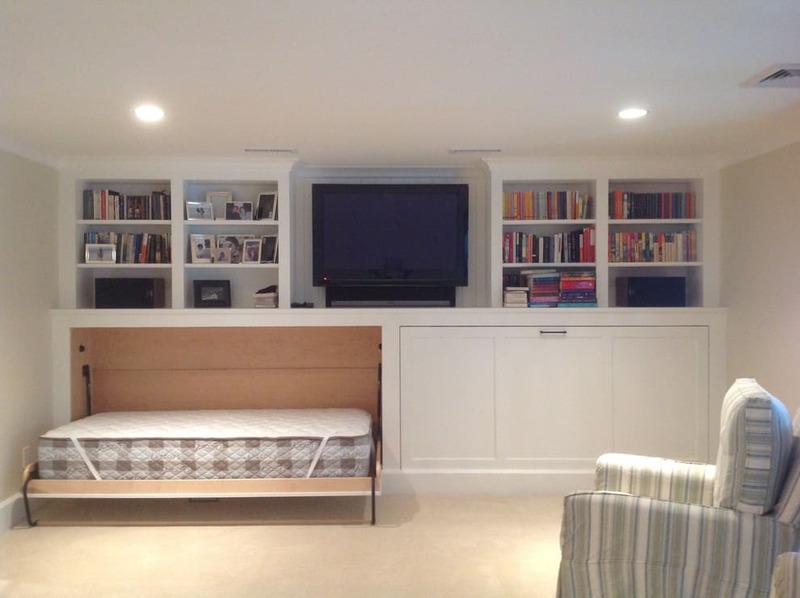 A Murphy bed reveal itself hiding behind the white paneled built-in media center. Photo by JR Custom Living, Inc. 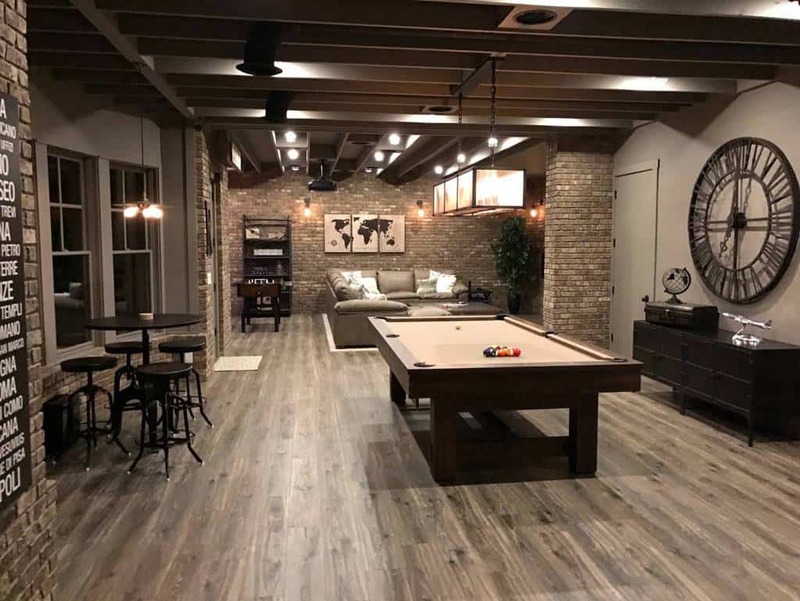 Exotic wood finish complemented the beige brick walls and together exudes a masculine vibe for a game room that features a billiard table and comfortable seating area. 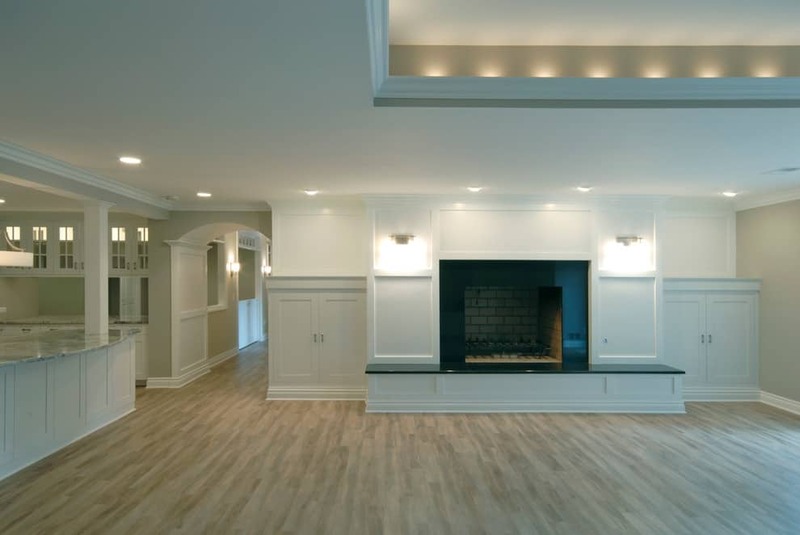 An empty room with a big fireplace and bigger potential is accented with decorative lighting. For a well-traveled look, put on display the memorabilia and antique goods you have collected, such as pictured here. 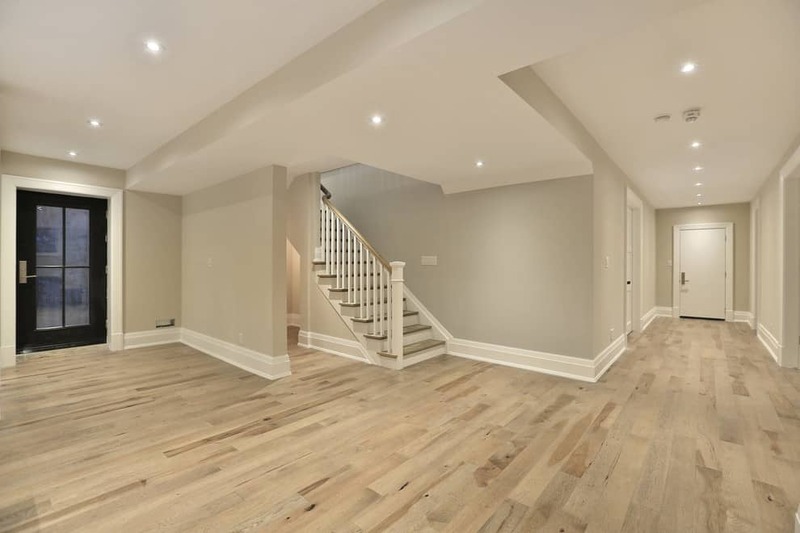 Raw wood in the ceiling and baseboard serves as a welcome accent. Two stylish chairs accompany the fashion-forward kitchenette enveloped in rough stone finishes in the wall that is reminiscent of an outdoor setting. 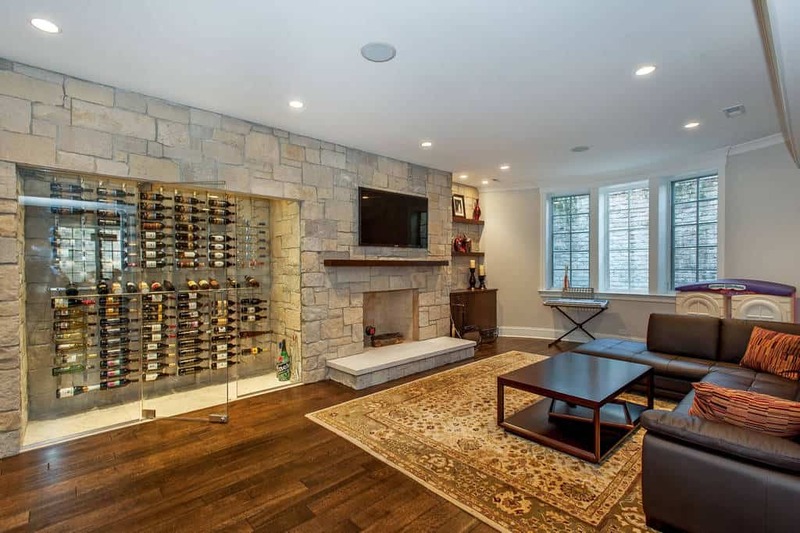 A variety of wine is set on display in a wall niche with glass doors and turns this relaxing home into an oasis for wine lovers. Vintage luggage becomes the coffee table and doubles as a centerpiece in an accommodating apartment. Exotic hardwood floors topped with blue and white rug creates an interesting contrast. A spacious kitchenette in stained wood finish allows a modern dining set with glass top and leather chair to reinforce style and practicality. Never miss any action movies with a room fitted with three flat screen TVs. Sit anywhere in the leather armchairs and comfortable sofa, or while drinking by the open bar. 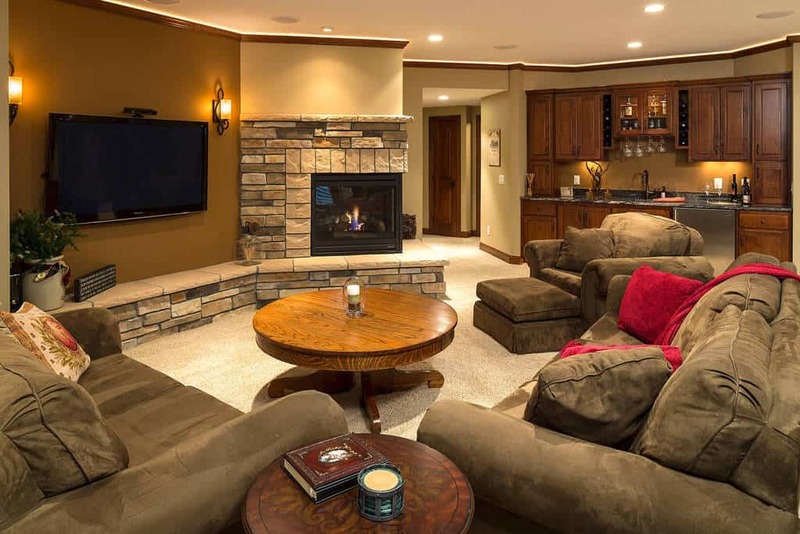 A modern fireplace is covered with brick stone finish. 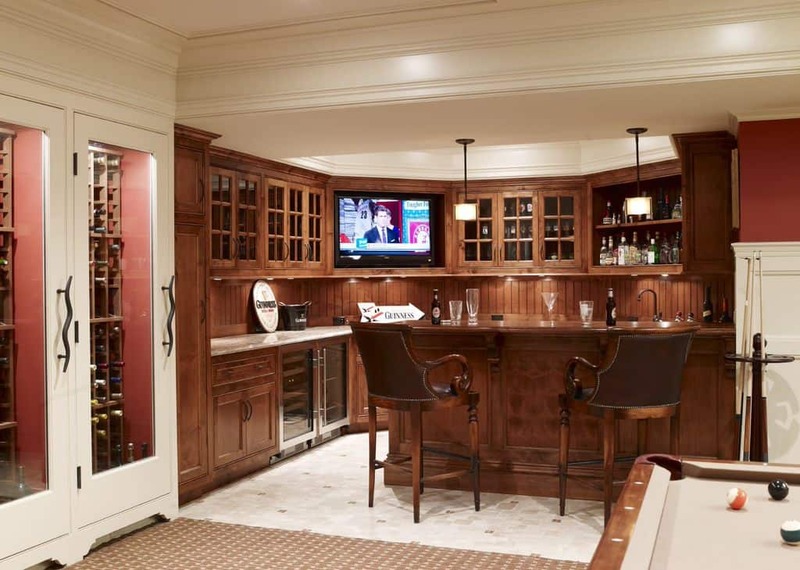 Stained wood cabinets in the open bar echo the sentiment. 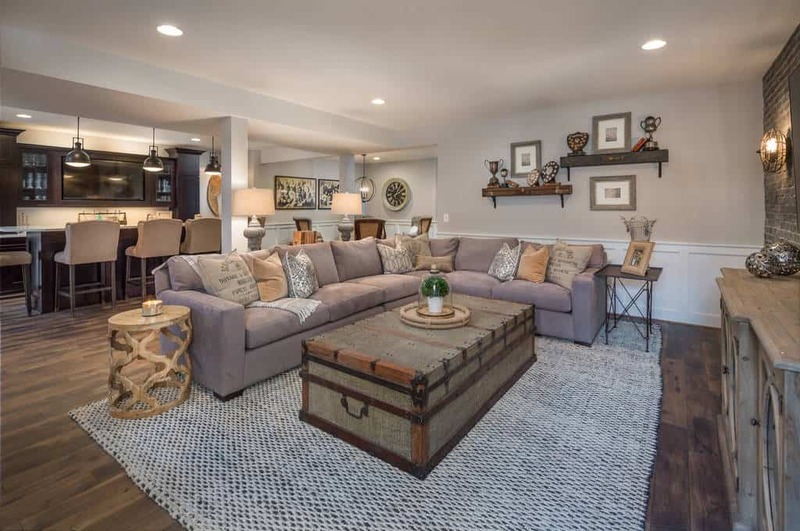 Sectional sofa in chenille upholstery faces off the wide flat screen TV in a flat that features hardwood flooring and cream colored walls. An inviting daybed is fashioned out of a recessed in the wall created by cushioning a wooden bed frame and then filling it with soft pillows. Framed artworks adds the final touch. Fit for an opulent home, this bar is covered with luxurious stained wood finishes and a pair of wooden barstool elevated the classical appeal. 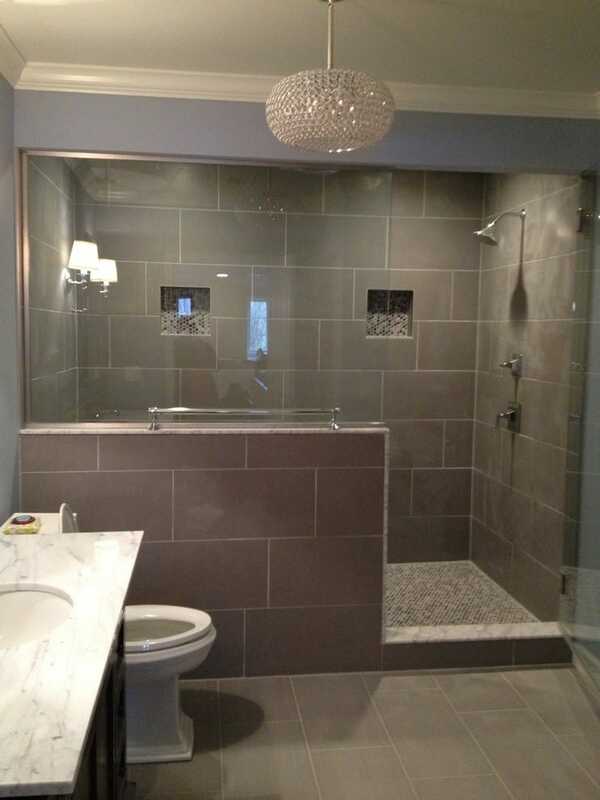 Crystal light fixture suspended in the ceiling of a contemporary bathroom lined with gray rectangular tiles sparkles as the light shines through it. 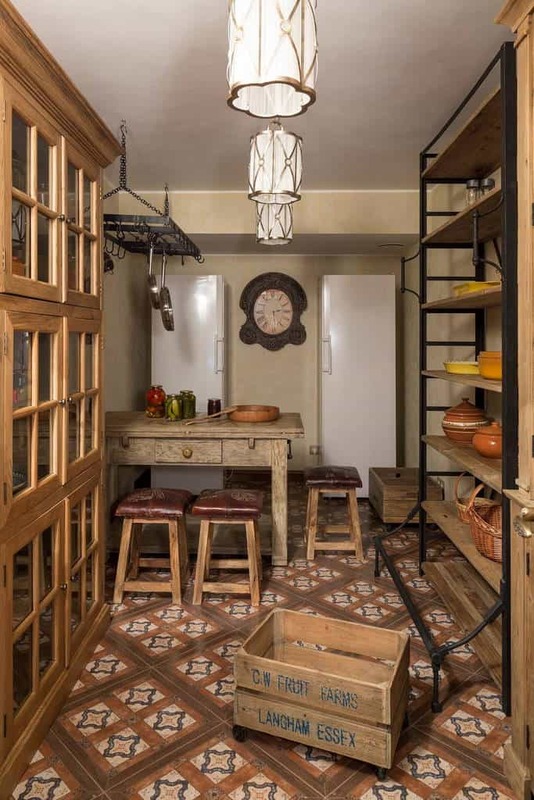 Spanish tile flooring helps amplify the rustic charm of a storage area that features a closed and open-type shelving and stools with leather seats. An all-neutral empty room presents a perfect opportunity to be filled with unlimited styles though its flexibility and ability to adopt.